Prior to filling, beer bottles are purged with CO2 to remove air and protect the taste against oxidation. In the fermentation process, yeast consumes sugar and expels a large amount of CO2 which can be "reclaimed" and used for this bottle purging purpose. Unfortunately, fermentation often also produces toxic, odorous sulfides which can foam up into the piping and contaminate the reclaimed CO2. In order to continue using the great resource of CO2 byproduct yet avoid contaminating the bottled beer with foul-smelling toxins, the reclaimed gas is run through sulfide removal skids. However, sulfide breakthrough can occur if the gas does not spend enough time in the scrubber. Employees are sometimes tasked with sniff-testing the reclaimed CO2 , but this is an unhealthy practice and is too discrete to vigilantly prevent product contamination. An automatic, continuous analysis solution is required in order to immediately divert contaminated CO2 from use in bottling as well as provide feedback control for the sulfur removal processing time. The OMA H2S Analyzer is used to continuously measure concentrations of hydrogen sulfide (H2S) and dimethyl sulfide (DMS) in the fermentation byproduct gas. 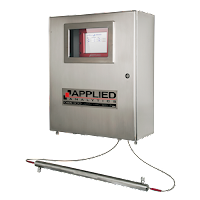 This system uses a full-spectrum UV-Vis spectrophotometer to detect the absorbance of sulfides in the reclaimed CO2 stream, an ideal method as CO2 has zero absorbance in the UV spectrum. The OMA provides fast response alarms to high-concentration threshold which allows immediate diversion of contaminated CO2. For this application, the OMA is typically multiplexed to automatically cycle analysis between multiple sampling points. This maximizes system value by allowing one unit to monitor the raw fermentation gas entering the reclamation system, gas coming off the acid aldehyde scrubbers, and the bottling gas coming off of the sulfur removal beds -- all with sample stream switching at user-defined intervals.